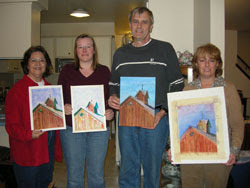 My Wednesday night group worked on a barn roof with a cupula last week. We experimented with using various washes in different stages of wetness. Our first wash was very wet-in-wet. Then we moved to damp paper and thicker paints until we used relatively dense paint on dry paper. We also used opposite colors for the shadow areas to build the contrast and values. This was a fun project and how amazingly different each piece looks! This was a great way to get those who work with rather dry pigment to use more water, and those who work very wet to experiment more with color variations. Great job everyone!